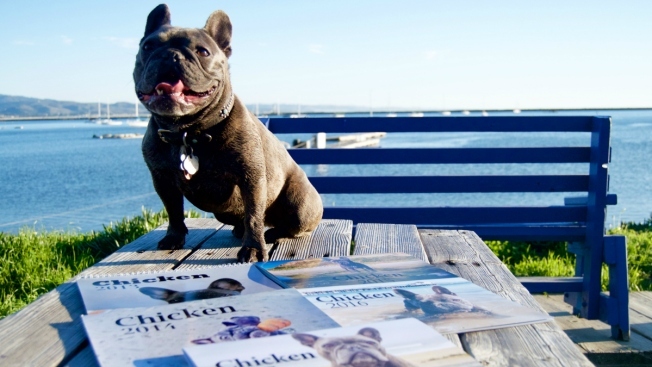 Chicken, a French Bulldog from the coast side, has become a bit of a celebrity, racking in about $4,500 last year with her annual calendar. "We started a Facebook page for her and she got a little bit of a following," Chicken's owner Travis Pynn said. "At some point we decided to turn her fame into a good charity, so we did a calendar." This will be the fifth calender Travis and Tara, a professional photographer, have produced with the proceeds benefiting Rocket Dog Rescue and Muttville Senior Dog Rescue. "She's kind of a little bit of a fur baby," Travis Pynn said. "Our way of giving back and helping others is using some of her cuteness to help other charities and nonprofits and share in the love of Chicken." The couple has orders coming in daily from neighbors, friends and from countries around the world. Travis Pynn previously worked for GoPro so, between Tara Pynn's photography and his work, he said Chicken has been around cameras her whole life. "It's 365 days of Chicken," Tara Pynn said. She works on the calender in her free time at the end of every year and says she loves it. "I don't know if anyone takes as many photos as we do on our iPhones, but I get to relive our lives," Tara Pynn said. "I just have so much joy going back on the memories." They like to keep the selection open and make it interactive on her Facebook page by holding votes for calendar-worthy shots. "She brings a lot of joy and a lot of people appreciate her as much as we do and we love sharing that," Travis Pynn said. Orders for the calendar can be made through Chicken's GoDaddy webpage.